The required compressed air is combined with the dry ice blasting medium in the blasting unit. This process requires cooling of the compressed air, and therefore represents a special technical challenge for the dry ice blasting hose. The standard length of our dry ice hose assembly is 7.5 metres, a length that has proved to be practical and effective. The dry ice blasting hose can be extended as required, for example by 5 or 10 metres. However, the total length should exceed 20 meters only in exceptional cases. It is advisable to also lengthen the compressed air hose accordingly. As a general rule, the shorter the blasting hose, the greater the kinetic energy on the object, namely the surface. The coupling system and connections are made of stainless steel and are protected against twisting. The White Lion hose assembly is equipped with a high quality stainless steel coupling system. 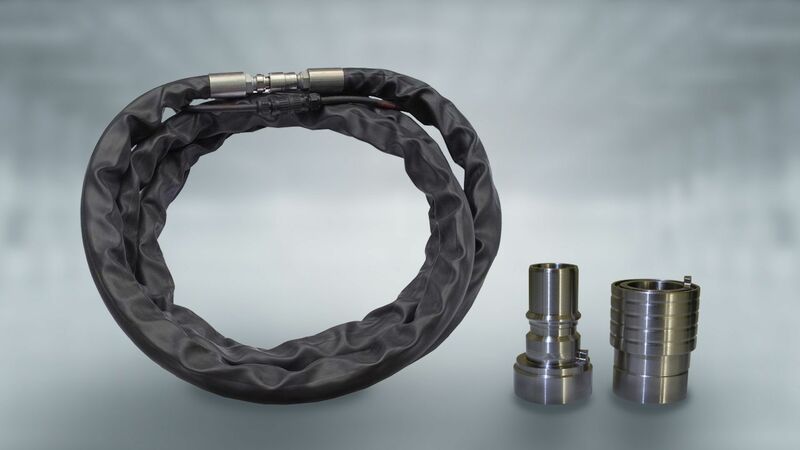 The quick coupling system is equipped with a 360 degree twist protection. With this solution you can securely and comfortably attach hose assemblies to our dry ice blasting machines. Blasting hose extensions are also possible. If necessary you can extend a 10 meter hose assembly with a 7.5 meter assembly. The White Lion dry ice blasting hose assembly can be used with all of our dry ice blasting systems.